Christmas Day is a Christian holiday that celebrates the birth of Jesus Christ, and it is also celebrated as a non religious cultural holiday. It is a public holiday in many countries, and is celebrated in some countries where there is not a large Christian population. It takes place after Advent and the Nativity Fast, and begins Christmastide, or the Twelve Days of Christmas. The name of the holiday is shortened from "Christ's mass," and throughout history the day has been known as "midwinter," "Nativity," "Yule," and "Noel." The New Testament gospels of Luke and Matthew describe Jesus as being born in Bethlehem, in Judea. Luke's account tells of Joseph and Mary traveling to Bethlehem from Nazareth for a census, and Jesus being born in a stable and being laid in a manger. According to this account, angels proclaimed him as the savior, and shepherds came to visit him. Matthew's account tells the story of the magi following a star in the sky and bringing Jesus gifts. The month and date of Jesus' birth is unknown, but the Western Christian Church placed it as December 25 by at least 336 CE, when the first Christmas celebration was recorded, in Rome. This date later became adopted by Eastern churches at the end of the fourth century. Some Eastern churches celebrate Christmas on December 25 of the Julian calendar, which is January 7. The date of December 25 may have been chosen for a few reasons. This is the day that the Romans marked as the winter solstice, the day when the Sun would begin remaining longer in the sky. Jesus also was sometimes identified with the Sun. The Romans had other pagan festivals during the end of the year as well. December 25 also may have been chosen because it is about nine months after the date commemorating the Crucifixion of Jesus. Christmas celebrations were not prominent in the Early Middle Ages, and the holiday was overshadowed by Epiphany at the time. Christmas started to come to prominence after 800 CE, when Charlemagne was crowned emperor on Christmas Day. During the Middle Ages it became a holiday that incorporated evergreens, the giving of gifts between legal relationships—such as between landlords and tenants, eating, dancing, singing, and card playing. By the seventeenth century in England the day was celebrated with elaborate dinners and pageants. Puritans saw the day as being connected to drunkenness and misbehavior, and banned it in the seventeenth century. But, Anglican and Catholic churches promoted it at the time. Following the Protestant Reformation, many new denominations continued celebrating Christmas, but some radical Protestant groups did not celebrate it. In Colonial America, Pilgrims were opposed to the holiday, and it wasn't until the mid nineteenth century that the Boston area fully embraced the holiday. But, the holiday was freely practiced in Virginia and New York during colonial times. Following the Revolution it fell out of favor in the United States to some extent, as it was seen as being an English custom. Around the world there was a revival of Christmas celebrations in the early nineteenth century, after it took on a more family oriented, and children centered theme. A contributing factor to this was Charles Dickens' publication of A Christmas Carol in 1843. His novel highlighted themes of compassion, goodwill, and family. Seasonal food and drink, family gatherings, dancing, games, and a festive generosity of spirit all are part of Christmas celebrations today, and were part of Dickens' novel. Even the phrase "Merry Christmas" became popularized by the story. In the United States, several of Washington Irving's short stories in the 1820s helped revive Christmas, as did A Visit From St. Nicholas. This poem helped to popularize the exchanging of gifts, and helped Christmas shopping take on an economic importance. It was after this that there began to be a conflict between the spiritual and commercial aspects of Christmas as well. By the 1850s and 1860s, the holiday became more widely celebrated in the United States, and Puritan resistance began to shift to acceptance. By 1860, fourteen states had adopted Christmas as a legal holiday. On June 28, 1870, it became a federal holiday in the United States. Celebrations of Christmas in the United States and other countries are a mix of pre-Christian, Christian, and secular influences. Gift giving today is based on the tradition of Saint Nicholas, as well as on the giving of gifts by the magi to Jesus. Giving also may have been influenced by gift giving during the ancient Roman festival Saturnalia. Closely related and often interchangeable figures such as Santa Claus, Father Christmas, Saint Nicholas, and Christkind are seen as gift givers to children—the best known of which is Santa Claus. His name is traced back to the Dutch Sinterklaas, which simply meant Saint Nicholas. Saint Nicholas was a fourth century Greek bishop who was known for his care of children, generosity, and the giving of gifts to children on his feast day. During the Reformation, many protestants changed the gift giver to the Christ child, or Christkindl, which was changed to Kris Kringle in English. The date of giving changed from Saint Nicholas Day to Christmas Eve at this time. Modern Santa Claus started in the United States, particularly in New York; he first appeared in 1810. Cartoonist Thomas Nast began drawing pictures of him each year beginning in 1863, and by the 1880s Santa took on his modern form. Attending Christmas services is popular for religious adherents of the holiday. Sometimes services are held right at midnight, at the beginning of Christmas Day. Readings from the gospels as well as reenactments of the Nativity of Jesus may be done. Christmas cards are another important part of Christmas, and are exchanged between family and friends in the lead up to the day. The first commercial Christmas cards were printed in 1843—the same year as the printing of Dickens' A Christmas Carol. In 1875 the first commercial Christmas cards made their debut in the United States. Today both religious and secular artwork adorns the cards. Music has long been a part of Christmas. The first Christmas hymns came about in fourth century Rome. By the thirteenth century, countries like France, Germany, and Italy had developed Christmas songs in their native language. Songs that became known as carols were originally communal folk songs, and were sung during celebrations such as "harvest tide" as well as Christmas, and began being sung in church. The singing of Christmas songs went into some decline during the Reformation. "Hark the Herald Angels Sing" came about in the eighteenth century, and "Silent Night" was composed in 1818. Christmas carols were revived with William Sandy's Christmas Carols Ancient and Modern in 1833, which included some of the first appearances of "The First Noel," "I Saw Three Ships," "Hark the Herald Angels Sing," and "God Rest Ye Merry, Gentlemen." Secular Christmas songs began to come about in the late eighteenth century. "Deck the Halls" was written in 1784, and "Jingle Bells" was written in 1857. Many secular Christmas songs were produced in the 20th century, in jazz, blues, country, and rock and roll variations: Irving Berlin's "White Christmas" was popularized by Bing Crosby; "Jingle Bell Rock" was sung by Bobby Helms; Brenda Lee did a version of "Rockin' Around the Christmas Tree;" "Rudolph the Red-Nosed Reindeer" was recorded by Gene Autry. Elvis Presley also put out a Christmas album. A special meal is often eaten on the day, and popular food varies from country to country. In United States, turkey with stuffing—sometimes called dressing—is often the main course, but roast beef or ham are also popular. Potatoes, squash, roasted vegetables, casseroles, and cranberry sauces are common. Popular drinks include tonics, sherries, and eggnog. Pastries, cookies, and other desserts sweeten the day, and fruits, nuts, chocolates, and cheeses are popular snacks. Finally, Christmas decorations are an important aspect of the holiday and include things such as trees, lights, nativity scenes, garland, stockings, angels, wreaths, mistletoe, and holly. The Christmas tree tradition is believed to have started in Germany in the eighteenth century, although some believe Martin Luther began the tradition in the sixteenth century. Christmas trees were introduced to England in the early nineteenth century. 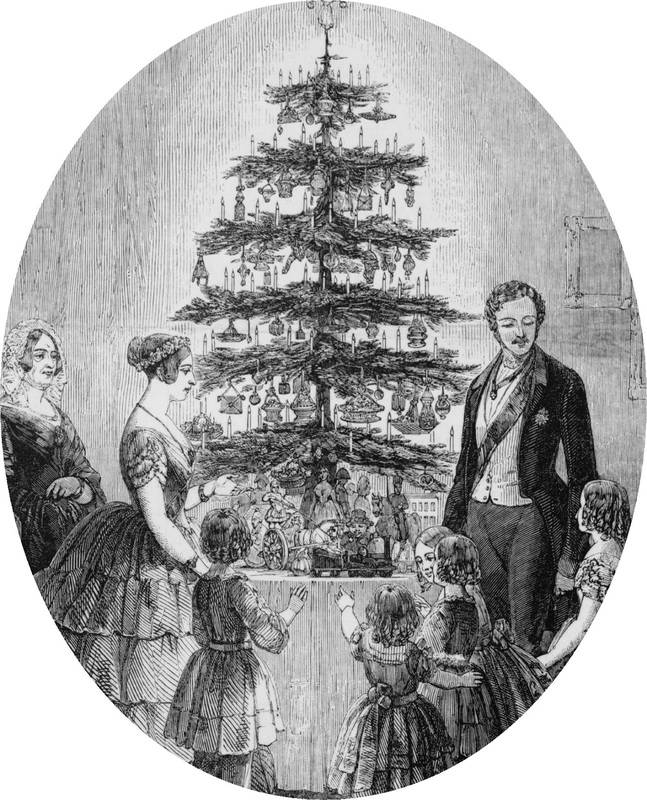 In 1848 the British royal family photo showed the family with a Christmas tree, and it caused a sensation. A version of the photo was reprinted two years later in the United States. By the 1870s the putting up of trees was common in the United States. They are adorned with lights and ornaments, and can be real or artificial. Christmas Day, also known as Christmas, is observed next on Wednesday, December 25th, 2019. It has always been observed annually on December 25th.